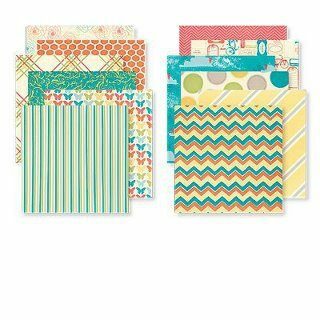 This is an incredible paper pack and it is only $5 when you order any $35 worth of product from the Spring/Summer Idea Book. It's 2 sided card stock. One side has colorful patterns and the other side has polka dots. The colors are Sunset, Lagoon, Grey Wool, Creme Brulee, Smoothie & Sweet Leaf. This cardstock cuts beautifully on my Cricut Machine. Don't miss out! !Clik the link on my side bar to shop with me online or email me your order.